Biomass production and CO2 fixing have been estimated for 32 main forest species of our woodlands (13 conifers, 15 broadleaves and 4 laurisilva and fayal-brezal species) and for other groups such “other conifers”, “other broadleaves” and “other laurisilva”, which are collections considered in the National Forestry Inventory.The results show that Spanish forests currently fix about 19% of the total CO2 emissions produced in Spain, which cofers them a trascendental role in the global carbon cycle. Furthermore, Spanish forests store ove 2,858 million tons of CO2, an extremely significant reserve that requires proper management in order to reduce fire hazard levels and to avoid the emission of large quantities of CO2 into the atmosphere. 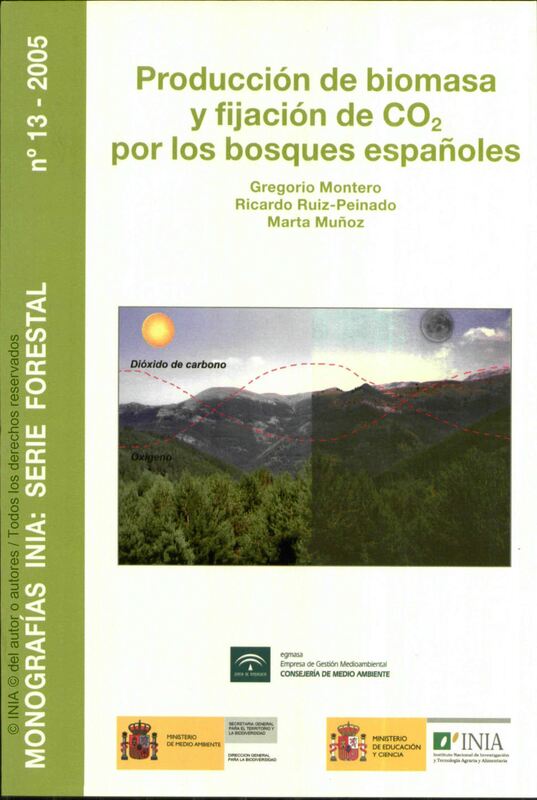 Spanish forests accumulated over 1,593 million tons of biomass (dry matter) in 2004. Physical Description : 270 p.; 17x24; il. - INIA. Servicio de Publicaciones. Ctra Coruña km 7,5. 28040 MADRID. Contact: distri@inia.es. Tel: (34) 91-3471493. This book was added to our online catalog on Tuesday 27 March, 2012.